Wire from a used spiral bound notebook or thick beading wire. 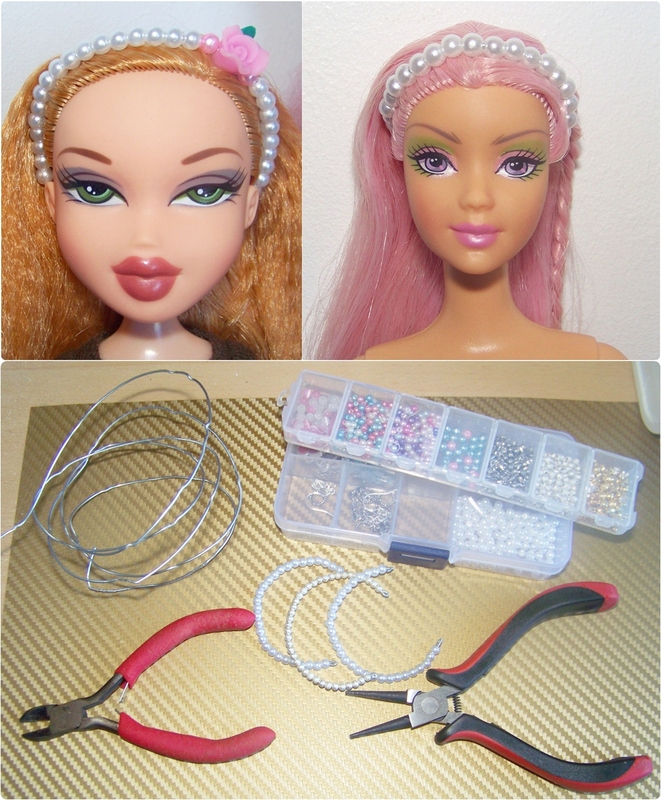 Cut 12cm of wire for a bratz head, 9cm for a barbie head, 20cm for a pullip head. Make a loop at the start of the wire, string on your beads and make another loop to close it. Bend the headband to fit your dolls head. You’re done! To straighten out spiral notebook wire, just jam a piece under your foot and use pliers to gently pull it straight. You can also wrap your wire with ribbon or yarn for different effects. If you have beading wire but it’s too thin and flexible then fold it in two and twist it tightly to make thicker wire. You can use bigger beads for Pullip heads but for smaller dolls, anything over 4mm looks out of scale. This entry was posted in Tutorials and tagged barbie, bratz, craft, doll, jewelry, pullip on July 16, 2012 by saffy.